For my clients Sarah and Brian, life is very full at the moment. They’re a young couple with a growing family – a toddler, a newborn and two dogs to be exact! 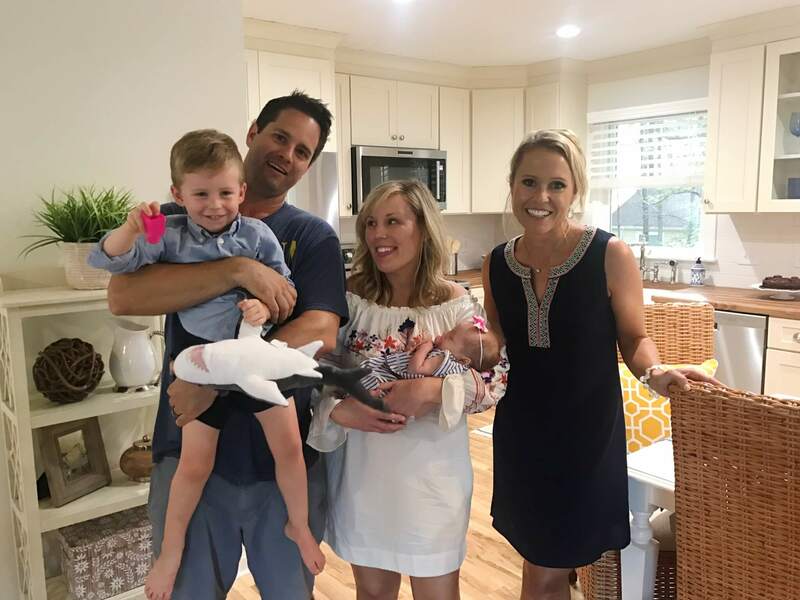 – and their snug beach home in Bethany Beach is chock-full of love, laughter and lots of activity. After the birth of their second child, Sarah and Brian knew their small house was crying out for a big upgrade. They wanted it to be more modern, open and inviting – where their kids could play happily, and they could all spend quality time together in the same space. And they needed to redesign one of the two bedrooms to accommodate both their toddler son and his new baby sister. 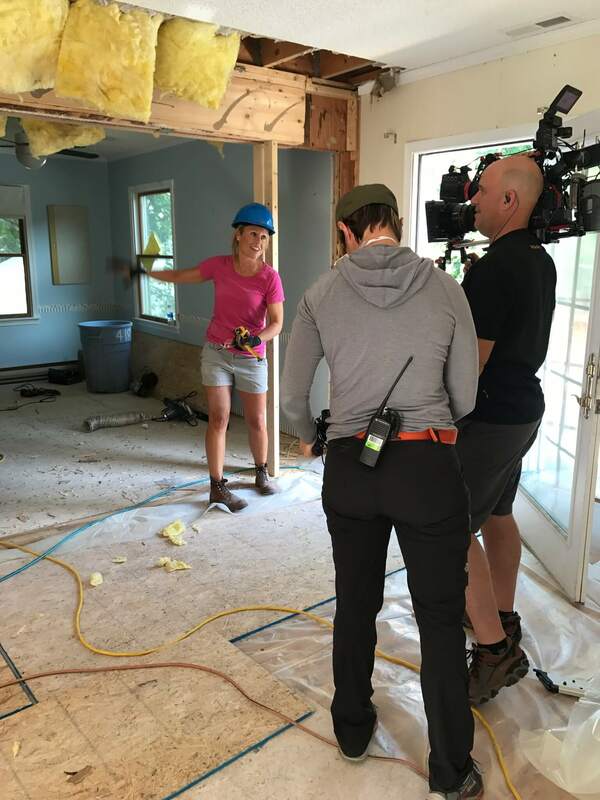 So I got to work dreaming up inventive ideas to solve Sarah and Brian’s space problems and create a beautiful home for their beautiful family. Problem: Even though the family room was partially open to the kitchen, its tight layout made it feel congested and closed off. It wasn’t an easy space for all four humans and two canines to hang out in. 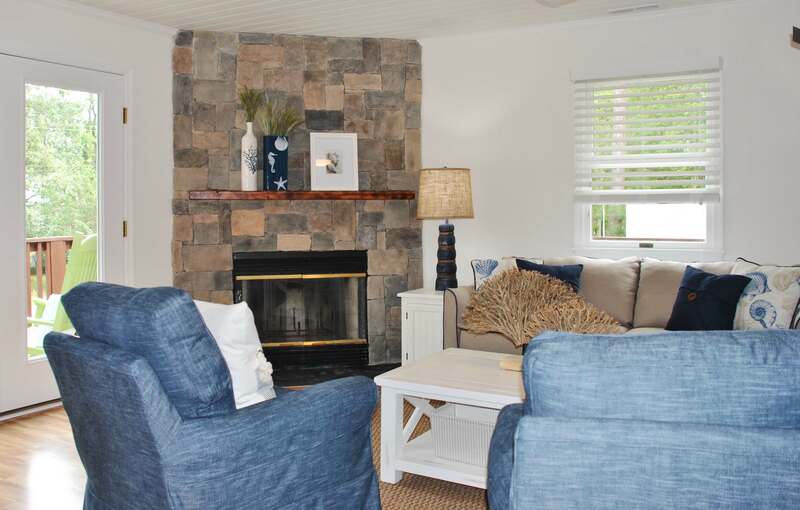 The room’s décor was also a bit bland; it craved more warmth and charm to reflect the family’s personality. Solution: An open-plan family area was at the top of Sarah and Brian’s wish list, so I knocked down the wall between the kitchen and living room. 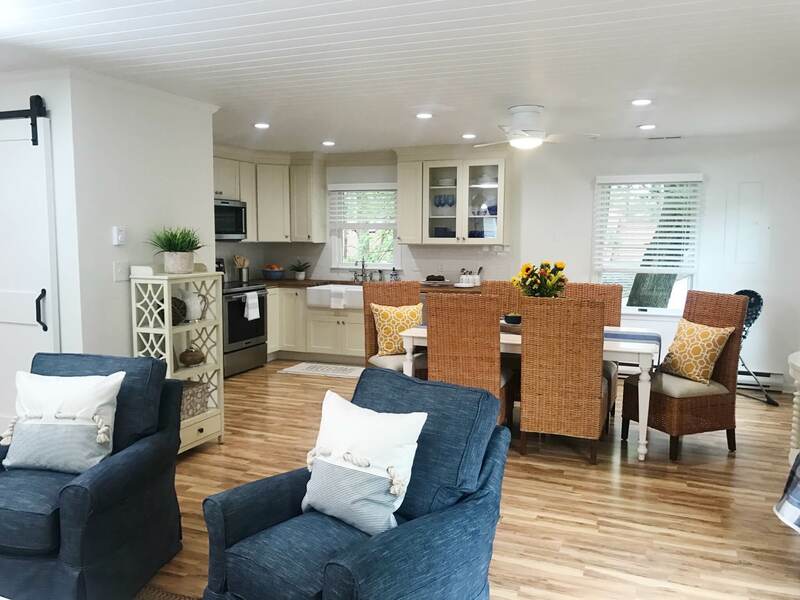 Now instead of two cramped, side-by-side rooms, there is one spacious living and dining area. My goal was to smarten up this space’s look, making it more modern and elegant, while still keeping its cozy and family-friendly appeal (let’s be realistic about what life is like with small children and pets!). I outfitted the living room with fabrics and furnishings that can handle a lot of wear and tear from little ones. To add more character and depth to the room, I added a gorgeous V-groove ceiling treatment and a stone veneer fireplace façade. A fresh coat of paint and new lighting completed the makeover. Problem: The original kitchen was dim, outdated and in need of a major renovation. The dark cabinets and cumbersome peninsula cut off the space awkwardly, making it appear smaller than it really was. 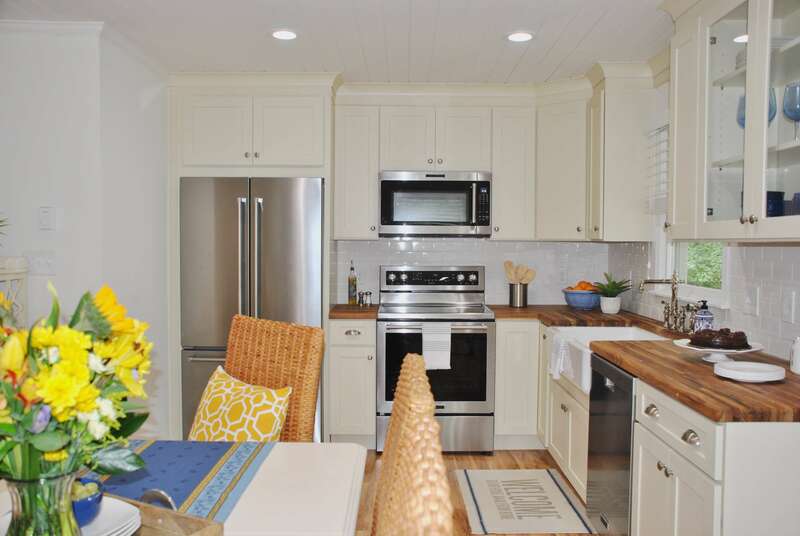 Solution: Without the dividing wall, the kitchen now flowed into the family room. This change had a huge impact, making the kitchen feel instantly bigger and more social. I took out the peninsula to open up the kitchen further, moving the new dining table in for a perfect area to serve comfy family dinners. 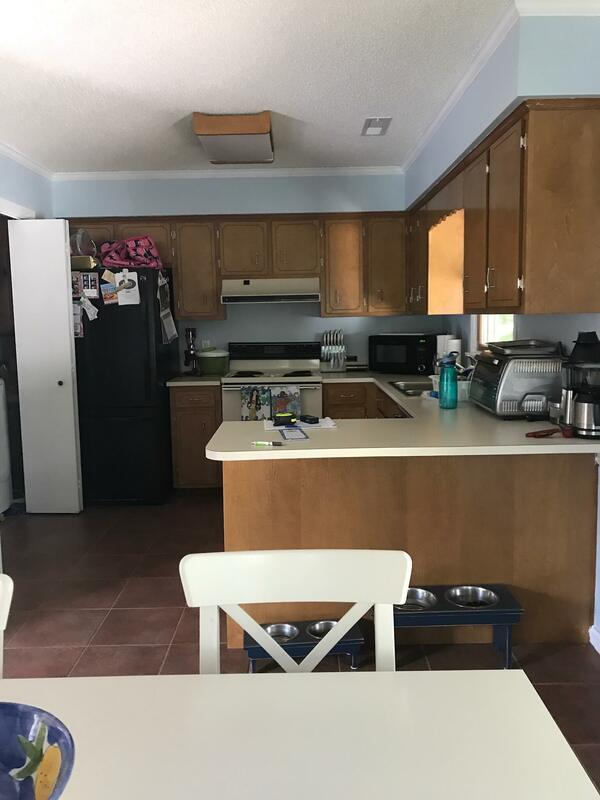 I refreshed the overall look of the kitchen, painting everything white, and installing new cabinets, appliances, and fixtures. I tore out the old flooring and replaced it with the same flooring from the family room. My favorite new addition was a big farmhouse sink. 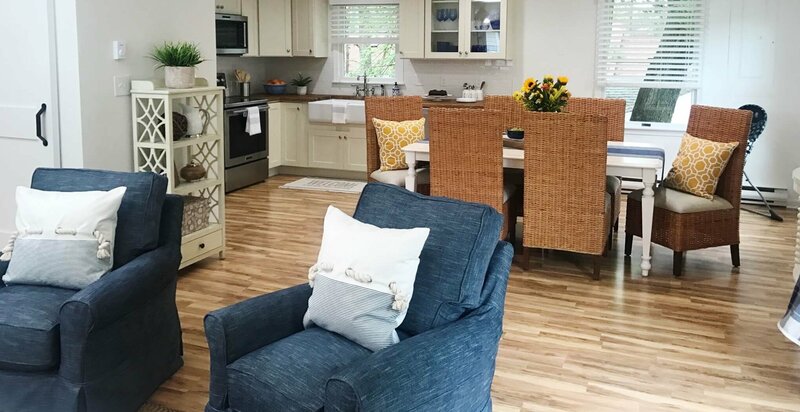 It gives the room a country-chic vibe, and it has plenty of room for dishes, bottles and even splashy baby baths. Problem: This bedroom was set up more like a guest room for adults than a sleeping/playroom for two little kids. It provided only one double bed, and it needed a good dose of imagination. Solution: The double bed had to go! I designed and built my signature bunk beds for the room, which offered tons more space for the two kids to grow into. The new layout also created a big play area in the center of the room, great for puzzles and games on a rainy day. To sprinkle a little more childlike fun into the room, I added a hanging rattan chair and a whimsical anchor wallpaper. 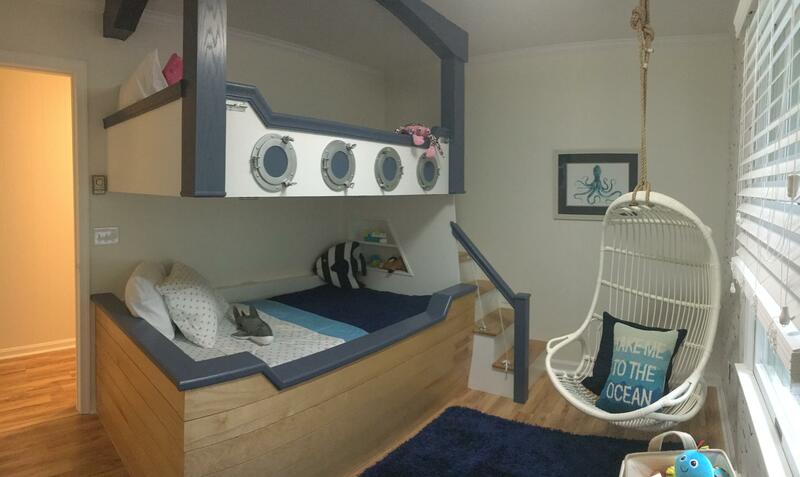 Many a pirate and mermaid and sailor will play in this room in the future! 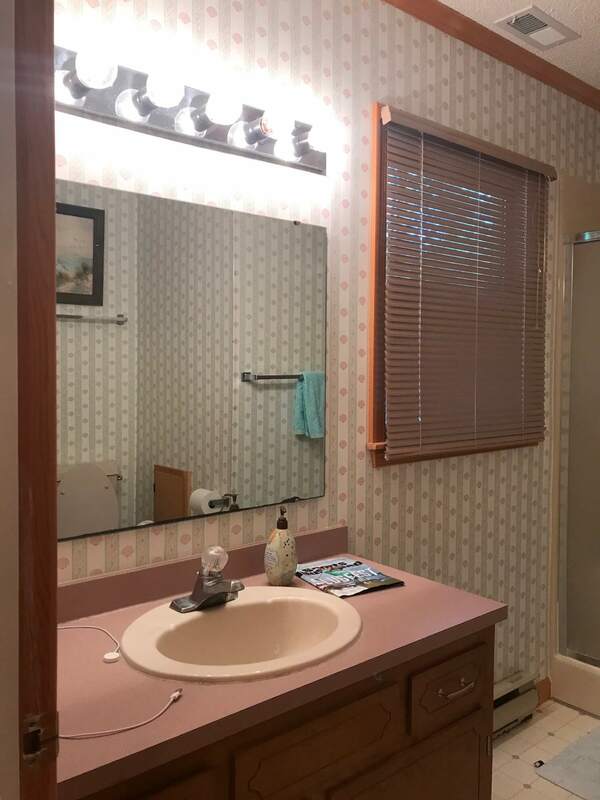 Problem: Everything about this bathroom demanded modernization: the floral wallpaper, the linoleum floors, the powder blue bathtub, and toilet. It had to be both kid-friendly and welcoming to guests. 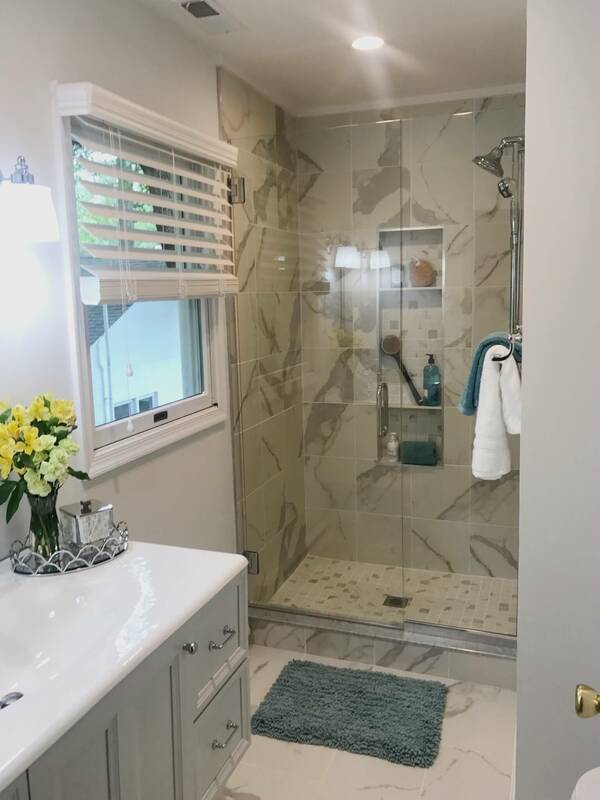 Solution: I gutted the bathroom completely, exchanging the old-fashioned for the contemporary with all new fixtures, sconces, and overhead lighting. 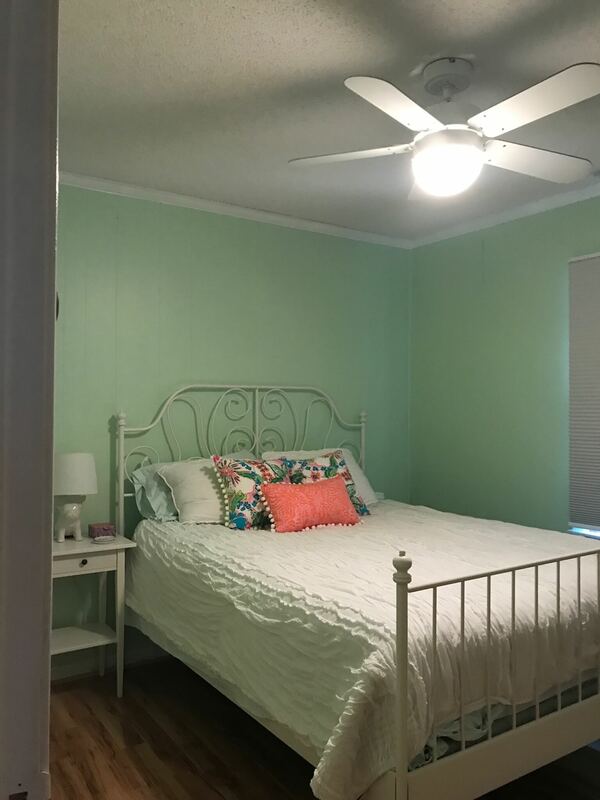 I tore out the wallpaper, and painted the walls, ceiling, doors and trim a fresh white. Additional shelving provided much-needed storage space for bath toys and beach towels. 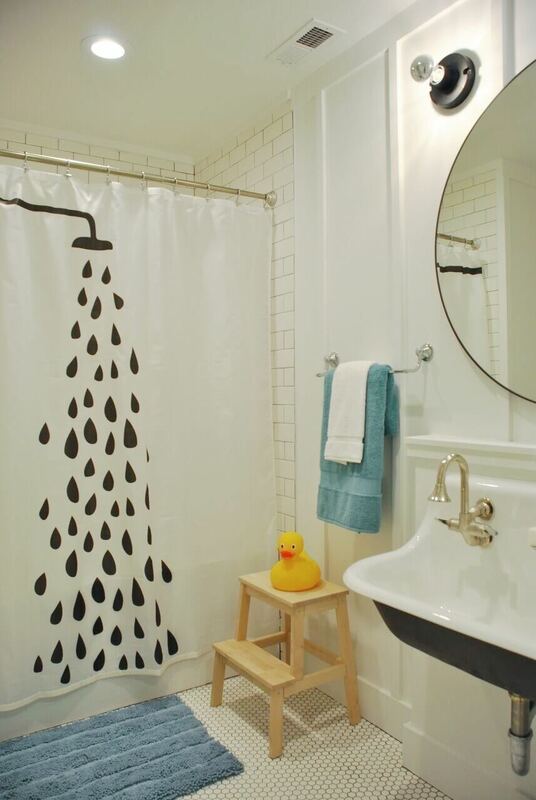 And I added a few eye-catching, black-and-white pieces – a large round mirror, a shower curtain with a graphic print, and a wide cast-iron double sink. Problem: I thought the kids’ bathroom was in a sad state, and then I saw Sarah and Brian’s bathroom! Its ancient wallpaper, mauve laminate counters, and narrow shower stall didn’t fit at all with this young, vibrant couple. Solution: My vision for the new bathroom was to build a calm, spa-like oasis for the grown-ups in the family. I renovated it completely, installing a polished new shower and vanity, but keeping the plumbing intact to minimize costs. I removed the terrible wallpaper and repainted with muted, soothing colors. The finished bathroom was almost unrecognizable from the original! Problem: The house had great bones, but it lacked real curb appeal. It needed a bit of sprucing up to stand out on the block. Solution: I started with a thorough cleaning of the exterior, power-washing the cedar siding and deck to make them look good as new. Then I upgraded the door hardware and exterior lighting and repainted all the shutters and trim. The final touch was a sentimental one. The house had an old life preserver ring hanging above the door. 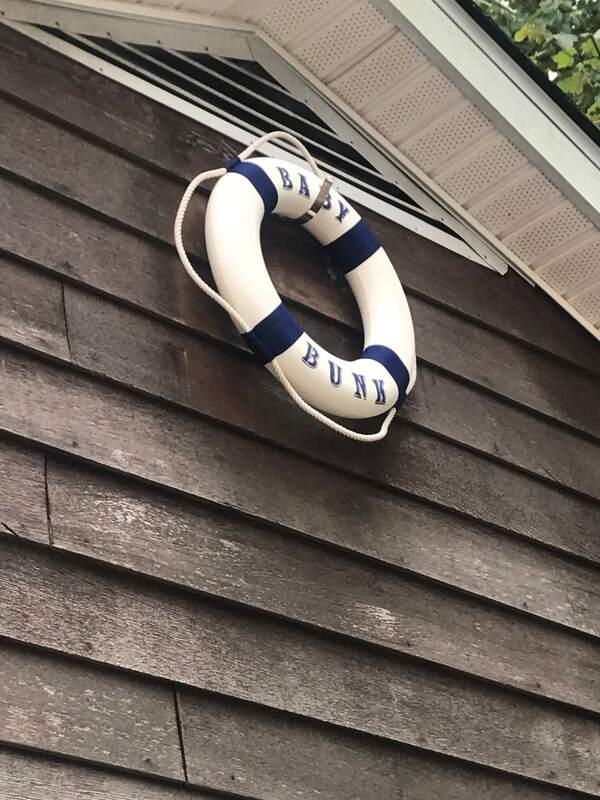 I replaced it with a new ring that reads, “Baby Bunk,” so Sarah and Brian can always remember their family’s origin story – and how it began right here in this home.